This item is 8 years and 1 month old; some content may no longer be current. Testing for thrombophilia is rarely indicated in general practice and should only be performed when the results will alter management. Who should not be tested? Thrombophilia is the increased tendency for a person to develop blood clots. There are a number of factors that contribute to increased thrombotic risk, many of which are well recognised and some of which are unknown. In most cases, the presence of one or more risk factors is thought to contribute to a thrombotic event. However, in some cases, described as idiopathic or unprovoked, a patient has no clear triggering event. Although over the last few years there has been increased interest in laboratory tests for investigating thrombophilia, their role in general practice is limited, their use is controversial and the results in most cases will not influence management. Testing may also lead to unnecessary anxiety and psychological distress, given that some inherited thrombophilic traits are very common but are of limited clinical significance. Thrombotic risk is an accumulation of a number of factors. 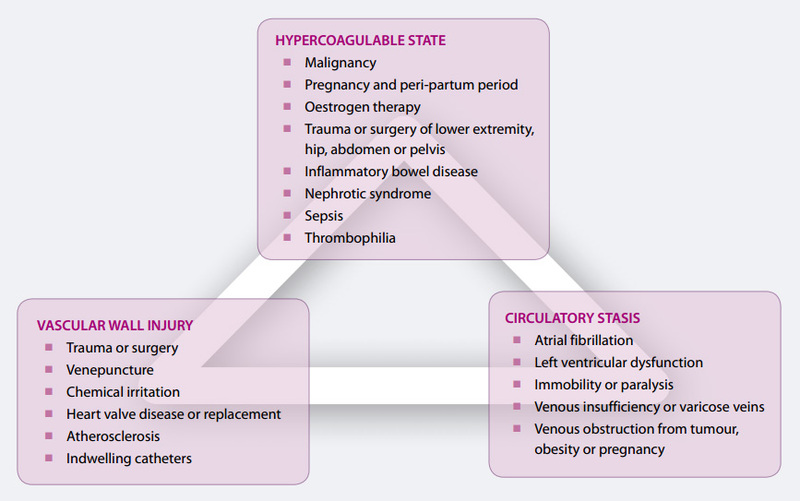 Virchow’s triad demonstrates this risk in terms of physiological states that promote thrombosis, including; circulatory stasis, hypercoagulability and vascular wall injury (Figure 1). Predisposing factors or current health status can alter one or more components of this triad. Most patients presenting with venous thromboembolism (VTE), will have more than one recognised risk factor, with overall risk increasing as the number of risk factors increase.1 Risk factors for VTE are listed in Table 1. When a patient presents to primary care with a VTE or a family history of VTE, it is important to perform a thorough clinical assessment to determine the presence of risk factors (Table 1), and to collect a personal and family medical history. This assessment can help to determine if the event was provoked, i.e. whether risk was exacerbated by external risk factors, or unprovoked, i.e. occurred for no apparent reason. The thrombotic load (large or small thrombosis) and the site (proximal or distal) should also be noted. It is recommended that all requests for thrombophilia tests are first discussed with a haematologist. In addition, requests should be accompanied by all relevant clinical information. Laboratories may reject the specimen unless there is sufficient clinical information to justify testing. There are a number of other markers that may be implicated in increasing risk of VTE, however, they have currently not been demonstrated to be independent risk factors.7 In addition, it is likely that a number of other yet to be identified mutations exist. People presenting with unprovoked venous thrombosis at an early age (<40 years), with a family history of thrombosis (more than two other symptomatic first degree family members). The yield of testing and the significance of positive results are likely to be increased in this group of patients. However, strong clinical history should be taken into account when making future decisions such as contraceptive options, pregnancy management and prophylaxis in high-risk situations, irrespective of the results of thrombophilia testing. Negative results in an individual with a strong personal or family history of VTE does not necessarily mean that they are at low risk of VTE. Children with purpura fulminans. This is a rare condition presenting as a progressive haemorrhagic skin necrosis. It may be either inherited (as congenital Protein C deficiency) or acquired (Protein S deficiency). All infants and children with purpua fulminans should be tested urgently for Protein C and S deficiency,8 since this result will alter management in this situation. Pregnant women at risk of venous thrombosis. Pregnant women who have had a previous VTE due to a minor provoking factor, i.e. a less significant risk factor, or who have a first degree relative with a previous VTE due to minor provoking factor, should be tested.8 Most pregnant women with a previous unprovoked VTE will be given anticoagulation treatment based on clinical risk alone, and testing is not required. Case 1: A well-informed, intelligent 22-year-old female has been on the combined oral contraceptive (COC) pill since age 18 years. She is a smoker. There is no significant past medical or family history of VTE. She has read that she is at risk of DVT being on the COC and asks to be tested for thrombophilia. Is testing indicated? There is no indication to request thrombophilia tests for this patient. There is a slightly increased risk for women on COC, although the fact that she has been on the COC for more than a year without incident puts her in a lower risk group as patients with thrombophilia who develop DVT tend to do so in the first year. Any perceived risk would be best managed by reducing other contributing factors such as obesity, and recommending smoking cessation, if relevant. Case 2: A 50-year-old male presents prior to a long distance flight. His mother died from a PE two years ago. He is very worried because he had a spontaneous DVT himself several years ago. He is also obese and has very bad varicose veins. Is testing indicated? This patient has a strong personal and family history of VTE and testing is not going to determine management. Prophylaxis is advisable in view of the patient’s risk factors and the patient’s anxiety about his mother’s death. Case 3: A healthy 33-year-old female presents in her first pregnancy. She tells you she had previously had VTE when she flew to England ten years ago. Is testing for hereditary thrombophilia indicated? Recent clinical guidelines recommend that this patient should have thrombophilia testing.8 Travel is considered a minor risk factor for VTE, and on its own would be unlikely to contribute to the thrombotic event. Therefore, it is likely there are other provoking factors present. If clinical assessment does not identify any other contributing factors, thrombophilia testing would be indicated. Although patients may present with the classic symptoms of deep vein thrombosis (DVT) or pulmonary embolism (PE), they can also pose a diagnostic challenge if the classic signs and symptoms are absent. In patients with symptomatic VTE, PE manifests in one-third and DVT alone in two-thirds. D-dimer is a fibrin degradation product, and is elevated in nearly all patients with VTE, but can also be elevated in patients with infection, malignancy or recent surgery. Because of the low specificity of D-dimer for VTE, its key role is as a negative predictor of VTE, i.e. a low or normal D-dimer level with a low pre-test probability makes VTE an unlikely diagnosis. It can sometimes be difficult to differentiate between DVT and superficial vein thrombosis (SVT). SVT or superficial thrombophlebitis, is often associated with conditions that increase thrombotic risk, e.g. surgery or trauma, immobilisation, malignancy. A patient with SVT will often present complaining of a painful, red, firm lump in the lower leg. Clinical examination will usually confirm the diagnosis, but in some cases further investigation may be required as SVT and DVT can co-exist (because a superficial thrombus can move into the deep veins). The presence of clot within a vein may be palpable as an indurated (hardened) nodular cord, however in some cases the clot may only be accurately diagnosed with ultrasound. N.B. Clots that occur in the main deep vein of the thigh (“superficial” femoral vein) should be classified and treated as a DVT as the femoral vein is part of the proximal deep venous system. Thank you to Dr Bart Baker, Haematologist, MidCentral District Health Board, for expert guidance in developing this article. Anderson F, Spencer F. Risk factors for venous thromboembolism. Circulation 2003;107:I-9. Merli G. Pathophysiology of venous thrombosis, thrombophilia and the diagnosis of deep veing thrombosis-pulmonary embolism in the elderly. Clin Geriatr Med 2006;22(1):75-92. Kyle C (ed). A handbook for the interpretation of laboratory tests. 4th Ed. Auckland: Diagnostic Medlab; 2008. Toll D, Oudega R, Boulten R, et al. Excluding deep vein thrombosis safely in primary care. J Fam Pract 2006;55(7):613-8. Caprini JA, Glase C, Anderson C, Hathaway K. Laboratory markers in the diagnosis of venous thromboembolism. Circulation 2004;109(suppl I):I-4-I-8. Tripodi A, Mannacci PM. Laboratory investigation of thrombophilia. Clin Chem 2001;47(9):1597-1606. Markris M. Thrombophilia: grading the risk. Blood 2009;113(21):5038-9. Baglin T, Gray E, Greaves M, et al. Clinical guidelines for testing for heritable thrombophilia.Br J Haematol. 2010;149(2):209-20. Osinbowale O, Ali L, Chi YW. Venous thromboembolism: a clinical review. Postgrad Med 2010;122(2):54-65. White RH. The epidemiology of venous thromboembolism. Circulation 2003;107:I-4. van der Velde EF, Toll DB, ten Cate-Hoek AJ, et al. Comparing the diagnostic performance of 2 clinical decision rules to rule out deep vein thrombosis in primary care patients. Ann Fam Med 2011;9:31-36. Fernandex L, Scovell S. Superficial thrombophlebitis of the lower extremity. UpToDate 2010. Available from: www.uptodate.com (Accessed March, 2011). Ho WK. Deep vein thrombosis – risks and diagnosis. Aust Fam Physician 2010;39(6):468-74. This article is 8 years and 1 month old. Guidelines for testing, perioperative and bleeding management for dabigatran and rivaroxabanRivaroxaban: a fully-subsidised oral anticoagulantIntravenous ferric carboxymaltose: now available for the treatment of iron deficiencyAn update on managing patients with atrial fibrillationThe safe and effective use of dabigatran and warfarin in primary care Upfront: Are blood eosinophil counts helpful in predicting patient responses to inhaled corticosteroids in COPD? Testosterone use in older malesResearch Update: Testosterone use and cardiovascular risk in older malesPrescribing testosterone in ageing males: why you shouldn’t read this articleIs point-of-care CRP testing useful in guiding antibiotic prescribing in patients with respiratory tract infections?